Why doesn't your website cut it anymore? You need a completely new way of thinking! We have been working with Peaklife Sport for several years now, and if you go to a Peaklife Sport event you will find our logo dotted about, not least on the start and finish line. 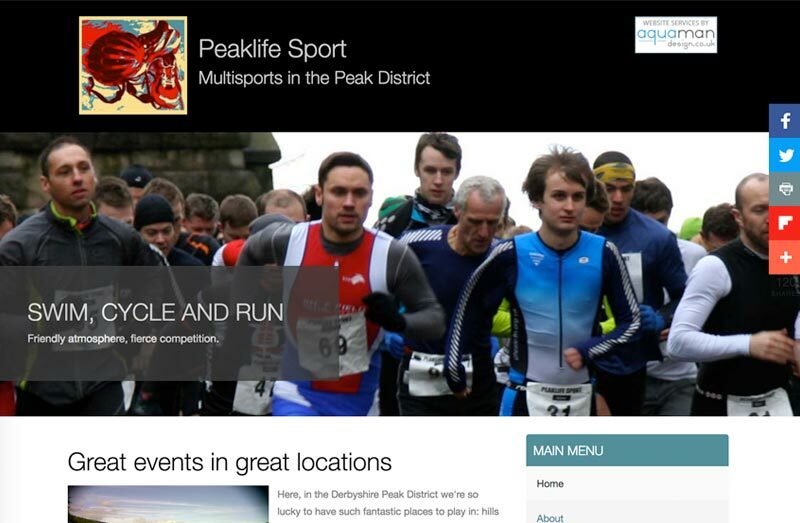 You can visit the Peaklife Sport website to view the Extreme Sports in the Peak Distirct they run. So this version of the website is the second incarnation. The first was not mobile responsive, so in 2017 Aquaman Design revamped the site with a new design and added mobile responsiveness. We continue to enjoy a close working relationship with Peaklife Sport providing our unlimited updates maintenance support. This means software is always kept up to date and local backups are taken every month. In many cases we have updated the site CMS within a few hours of an update being released. Site maintenance is an important part of modern websites, reducing the chances of a website being hacked. Copyright 2019 by Aquaman Design.